Protected Bike Lanes, Coming Soon? 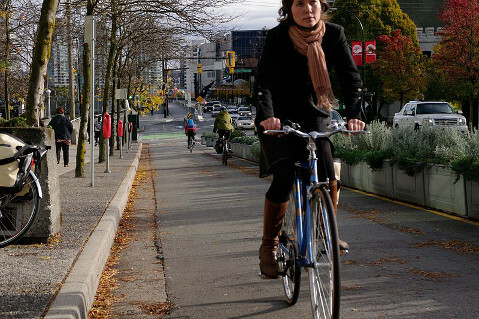 A bike lane separated from cars adds safety in Vancouver, Canada. Where would you ride, if you weren’t afraid of cars? Would you bike with your children to school? Ride to work? Run errands around the neighborhood? 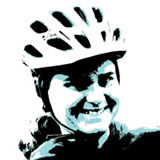 Although 100 million Americans ride a bike each year, most of them do so sporadically. Of those who reported biking in 2014, the majority rode less than three times a month, and only 15 percent rode for transportation, rather than recreationally. Fear of traffic keeps many from riding. Even in “bike friendly” Portland, traffic worries keep people from pedaling. According to the Portland Bureau of Transportation, 60 percent of its residents fit into the “interested but concerned,” category. Cities across the country are working toward a solution: protected bike lanes. These lanes are separated from cars by a buffer of curbs, cement planters, or plastic cones. The barriers encourage worried riders to bike more, creating corridors of safer travel and helping to relieve traffic congestion. In 2012, the number of protected lanes doubled. Detroit recently broke ground on its first protected lane. Minneapolis and Boston have announced plans to extend their protected lanes, with Minneapolis setting aside funds for an additional 5.6 miles. Earlier this month, Los Angeles opened its first protected lane on Reseda Boulevard, adding to the more than 200 in existence in the U.S. The new lanes are proving to be effective at boosting ridership and increasing safety. The New York City Department of Transportation reported that when a protected lane was introduced on Columbus Avenue, biking increased 56 percent on weekdays, while collisions decreased 34 percent. One study showed that protected lanes can reduce biking injuries in intersections by about 75 percent. But they don’t just improve outcomes for cyclists, they appear to make the roads safer for all travelers. After installing the lanes, some intersections have seen collision rates fall by nearly half for cars, bikes, and pedestrians alike. Wide, well-maintained paths mean more bikes where they belong and fewer cyclists riding on sidewalks out of fear. 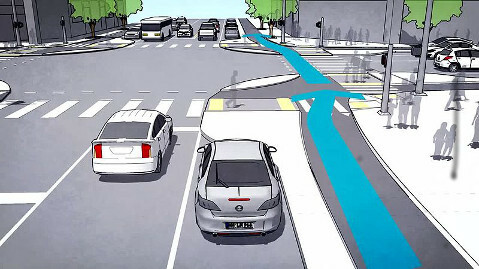 This lowers the risk to pedestrians and cyclists, and makes shopping easier for everyone. Drivers often appreciate the separation because it reduces the number of moving parts to track, and it makes the road more predictable. Protected lanes can help bridge these gaps. A cone-protected lane running from upper State Street to Stearns Wharf would streamline travel and connect every business and resident along the way. A protected lane running the length of Mission Street could help turn a perilously narrow stretch into a more comfortable and efficient roadway. If all our lanes were as well-utilized as the Cabrillo bike path, the impact on traffic and the health of our community would be substantial. Safer roads require an investment. Concrete curbs and raised bike lanes need the greatest funding, but there are other ways to create the lanes. Plastic cones can provide a more affordable option, and moving parking to the outside of the bike lane is also a lower-cost possibility. Along with the economic investment come the returns. Many Santa Barbara hotels are beginning to offer bike rentals; giving tourists a safe space to use them would be ideal. Unlike cars, bicycles have very little impact on roads. When more people opt to ride, fewer costly repairs are needed. More leaders are beginning to recognize the important role that biking will play in meeting future transportation needs. Increasing ridership and road safety has become a key focus for many U.S. cities as they work to solve parking shortages, breakdown of roads due to overuse, and dangerous interactions between travelers. Establishing protected bike lanes would help Santa Barbara continue the movement toward safer, healthier transit.